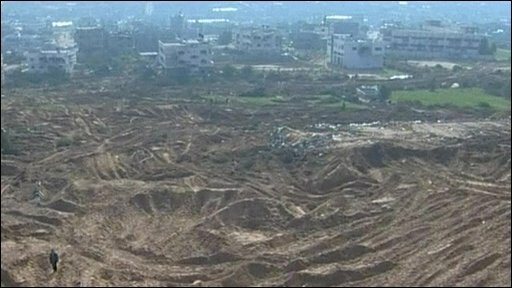 A libcom user and Anarchist Federation member analyses the 2008-2009 Israel-Gaza conflict, and the response of the left to events. Israel’s brutal attack on the Gaza strip has elicited widespread revulsion, and has led to protests across Britain and the world. It is clear that the Israeli state has committed atrocities which anyone with an ounce of humanity would seek an end to. Its savage bombing of one of the most densely populated places on earth has resulted in over a thousand deaths. Nowhere is safe – Mosques, schools and UN sites have been attacked by the IDF. Even by the “civilised” standards of warfare between nation-states, which allow for a reasonable degree of “collateral damage”, several incidents stand out for their brutality. There is mounting evidence that the IDF is following its senior partner, the US, in using white phosphorous as an offensive weapon in civilian areas. Banned under international law, white phosphorous munitions are chemical weapons with a pattern of splash damage similar to cluster bombs, but which spread blazing chunks of phosphorous and smoke laced with burning particles. The result is either death from suffocation or from severe burns, sometimes down to the bone. The IDF is responsible for herding civilians into a building before shelling it, killing scores of civilians in attacks on UN schools, shelling aid convoys, and destroying aid stockpiles during an attack on the UN headquarters in Gaza. The attack has displaced over 90,000 people, and combined with the crippling blockade of Gaza which preceded it, utterly destroyed Gaza’s economy and infrastructure. It is ultimately futile to debate the responsibility for starting the conflict. According to Haaretz, the Israeli attack has been in the planning stages since the signing of the original ceasefire. Like any military force, the IDF had military options prepared from the beginning, which have been implemented in order to break Hamas, stop its embarrassing rocket attacks, and to deliver an electoral boon to the ruling party. Hamas’ rockets were clearly already lined up and ready to strike Israel’s civilian population. Both sides required a spark in order to launch the conflict and advance their internal aims – Hamas to consolidate their position by forcing the collaboration or elimination of rival factions, Israel in order to provide a spectacular PR win prior to the elections and to slow down the confrontation between the state and the settlers. This was provided by the Israeli cross-border raid on the 4th of November. Following the launch of the brutal airstrikes and ground invasion, the sides behaved precisely as could be expected. Hamas, unsurprisingly, have shown themselves not to be consummate humanitarians. There have been a number of reports of refugees being held at the Rafah border crossing , preventing them accessing medical care in Egypt. Egypt blames Hamas, whilst Hamas claims that the injured refugees restrained themselves out of contempt for Egypt, refusing the care of the medical teams on the other side of the border (despite their not refusing the aid the IDF is obliged to provide, and despite the Gazan hospitals being devastated). Both sides were shown for the hypocrites they are when Gazan refugees breached the border themselves, to be faced by Egyptian border guards firing their rifles into the air. The capitalist factions in Gaza and the West bank have used the desired opportunity provided by the conflict to move against each other – Hamas has been killing, kneecapping, imprisoning and beating its rivals in Gaza, whilst Fatah has been doing the same to Hamas in the West Bank, on top of banning protestors from confronting checkpoints or the IDF. Rather than join the “resistance”, ordinary Palestinians in Gaza have been fleeing en masse. It seems that the factions are moving to a ceasefire now their perceived aims have been met. And the price for this has been a mountain of dead working class Palestinians. The conflict has spawned international revulsion, and a protest movement in Britain which has undertaken demonstrations in most major towns and cities, receiving a good deal of media coverage, especially after minor rioting in London on the 10th of January. Though there has been a genuine grassroots response to the conflict, many of the demonstrations have been organised by either the Stop the War Coalition, associated in the minds of many with the defeat of the campaign against the Iraq war, and the Palestine Solidarity Campaign. The atmosphere of the protests has differed from place to place, from demonstrations of a more humanitarian nature demanding the end of the bombings to virulent nationalism and support for Hamas. Most demonstrations contained a mixture of both. Libertarian Communists, anarchists and other internationalists have been involved from the start, seeking to provide an alternative on the ground to the nationalist ideologies which are pervasive within the anti-war demonstrations. The Sheffield and Manchester Anarchist Federation groups produced a leaflet which they distributed at demonstrations in the cities, and which were circulated in various forms by comrades in the Solidarity Federation, Organise!, No Borders and the libcom group in a display of fraternalism within the movement. Anarchists in London organised a distinct bloc against all nation states and the wars they wage, whilst another internationalist leaflet was produced and circulated at demos by the ICC. At the same time, there is plenty of opportunist leftist politicking around the issue. The Socialist Workers Party once again aligned itself with various liberal voices, demanding that the UK expel Israel’s ambassador and recall its embassy staff from Israel. The stupidity and opportunist posturing involved in asking Britain, which is responsible for maintaining an occupation in Iraq which has resulted in 1,033,000 deaths in the past 6 years, to bring Israel in line with civilised international behaviour isn’t lost on most people with critical faculties. But there are more fundamental qualities to the demonstrations which are alarming, and which stand in stark contrast to the attempts to spread an internationalist perspective on the conflict. As important as our efforts in this regard are, they represent a minority view in opposition to leftist “common sense”. To suggest that being anti-war might mean opposing both the capitalist factions engaged in it might not be that controversial to ordinary people, but is met with hysterics from leftists. As a result, there has been much in the anti-war movement that is troubling. Support for overseas nationalist movements has been common currency amongst leftists since the early twentieth century, and the belief that “national liberation” forces can strike a blow against “imperialism” and therefore open a space for an advance in the global struggle against capitalism remains common.1 For many leftists, “imperialism” comes down to US foreign policy and that of its proxies and allies such as Israel, and whatever force stands in opposition to this is “anti-imperialist”. For them, imperialism is not the tendency of the “anarchic” system of nation states to create a situation where states must assert themselves often against an empirical economic advantage (as in Iraq, where exploitation of resources could have taken place through cutting a deal with Saddam, rather than an expensive occupation which comes down to control of strategic resources). So where we might see a smaller imperialist scheme in opposition to a larger one, such as in the conflicts between US and Venezuelan or Iranian foreign policy, many leftists see “imperialism” confronting “anti-imperialism”. By a similar logic, to leftists, Hamas isn’t a bourgeois faction with its own aims and the agency to pursue them, but a “resistance” movement fighting an Israeli attack. As such even the Trotskyists who claim that they provide no political support to Hamas laud its “heroic” resistance – a resistance which has been utterly futile, and has consisted mostly in killing Israeli civilians, including (not that it matters) Arab-Israelis, and giving the IDF an excuse to slaughter the civilian population in Gaza. Of course, part of this thinking is as a result of basic liberal democratic arguments on international relations – a “nation” which is attacked has a “right” to “resist”. And following on from this, for many leftists, if you dispute this frame of reference, you are a “collaborator” with the “aggressor”. This is added to rhetoric about Hamas being “democratically elected” (as if the Israeli government wasn’t). This view is common, and fundamentally reactionary in that it requires not a class analysis, but a national one. But the crudest leftist defence of Hamas has come in the form of the argument that, if there was a left/socialist/anarchist (delete as applicable) presence in Gaza, we and Hamas would be “shooting the same way”. Presumably they don’t mean at civilians, but at “Israel”. This overlooks Hamas’ aims and actual activity when faced with rivals, but ultimately leads to the position that we should side with the less powerful bourgeois faction when they are fighting one another, even if in this case this is in a context where “resistance” means being obliterated by one of the most advanced militaries on the planet. Firstly, no-one with any interest in the working class improving its own conditions and ultimately taking political power for itself should have any interest in defending Hamas. Beyond the fact that they peddle a reactionary, mystifying, sexist, homophobic and anti-working class ideology, their track record in repressing workers is open to see. Teachers’ struggles have been caught between the hammer of the Hamas government and the anvil of Fatah aligned unions. Armed Hamas police have escorted teachers back into the classroom, whilst their bosses have sacked them and replaced them with loyal Hamas supporters. Hamas have closed medical facilities when faced with doctors’ strikes. The unions in the Palestinian territories are factional and bureaucratic, as all are, but the fact that the same unionists have been attacked by both factions shows how independent working class struggle would fare against these groups. Hamas offer as little to working class people as their rivals in Fatah, whose allies in Al-Aqsa Martyrs Brigades attacked Palestine Workers Radio for “stoking internal conflicts”. The AF’s leaflet arguing that “On both sides of the conflict, the idea that opposing Israel has to mean supporting Hamas and its ‘resistance’ movement” was met with criticism for claiming that support for Hamas is rife. But beyond the Hamas flags, which aren’t uncommon at demos, every call to support the “Palestinian resistance” means support for these factions. There is no vague, amorphous resistance to support, but real groups with real policies carrying out real actions in the real world. For this reason it is necessary to say precisely who and what you are supporting. The internationalists have been clear in stating their support for the victims of war, for self-organised campaigns such as those in the West Bank against the wall, for Israeli refuseniks and those who struggle against the war machine in Israel. Those who laud “the resistance” and chant “from the river to the sea, Palestine will be free” are either unthinking or disingenuous when they say this doesn’t mean supporting Hamas, however “critically”. As an example of the easy translation of "soft" support into outright support for Hamas, a group from the Trotskyist Alliance for Workers Liberty2 who turned up at a demonstration in Sheffield recently with a placard reading “No to the IDF, no to Hamas”, were assaulted by Palestine Solidarity Campaign organisers (who also have a record of attacking the liberal gay rights group Outrage!, fronted by the well known media stuntist Peter Tatchell, for raising a dissenting voice at demonstrations). The SWP contingent, including local Respect candidate Maxine Bowler, cheered the assault on, and lectured the AWL for being “scabs”. Similarly, genuine internationalists have met accusations of "elitism", that they offer Palestinians nothing, as if leftists were offering anything other than (ultimately meaningless) political support. Most of them aren't stupid enough to try to get arms and funds to the "resistance" they celebrate. But its not uncommon to see leftist impotence translate into overinflated self-importance. But on top of the dubious nationalism which is commonplace, there has been a resurgence in classical anti-Semitism. Following earlier attacks on Starbucks, in the same night a Tesco store was attacked in East London the area was daubed with graffiti reading “kill jews.” Graffiti reading “free Palestine, kill the jews” has gone up in South Manchester. Such statements simply mirror Hamas’ own anti-Semitism and conspiratorialism, which can be seen in its propaganda and charter. But there is also the more structural anti-Semitism which is common in leftist discourse, especially concerning the (demonstrably false) view that US foreign policy is a product of a pro-Israel lobby in the west, which has already been argued against well. The common comparisons between the Israeli attack and the systematic and industrialised extermination of Jews during the holocaust, beyond its appalling inaccuracy (was the invasion of Iraq a "holocaust"? ), feeds into this. Against this background, internationalists always have an important role to play. At every instance, we must plainly and clearly state that solidarity with the victims of war as real concrete human beings does not mean solidarity with capitalist factions in a war from which they seek to benefit, does not mean supporting a cross-class, abstract national collective and its ethnic “rights” to lands, and does not mean abandoning coherence to support a victory for a facile “anti-imperialism”. The defense of clear internationalist positions against leftist hysteria is of vital importance. It is for the benefit of those drawn into the demonstrations out of disgust at the attack on Israel, but repulsed by the hypocrisy of claiming to be anti-war whilst supporting one of the sides in it. 1. These people presumably aren’t going to tell striking workers in sweatshops in Vietnam that their “liberation” represents a blow against capitalism, or tell Zimbabwean workers that they should be happy to serve a ruling class which has struck such a hammer blow against imperialism. 2. The consequent coverage painted the AWL and Anarchist Federation as co-conspirators, due to AF members at the demonstration arguing against the censorship. The AWL support a two-state settlement in Palestine and consequently a secular left Palestinian nationalism. great article. might be something to link to in some of the IMC-UK bunfights, there's bound to be some sensible lurkers on there (i was one once), not that what leftists/activists think is particularly important in the scale of things. I've been a bit lackadaisical about it in the past, but I would like to see online sources for the claim that Hamas has barred Palestinians from seeking aid across the border with Egypt. Sure, here are some of the ones I used. Tensions at the border, Gaza's only one not with Israel, had risen during the day, with Egypt blaming Hamas for not letting wounded Palestinians through and Hamas asking for medical aid to be handed over. Now,given the fact that Gazans did cross the border en masse after it had been closed again, despite armed Egyptian police, Hamas' claims that people were voluntarily refusing medical treatment strike me as very dubious indeed. So you've got both sides using the refugees as political playing pieces. No surprise there. I am shocked and appalled. Thanks a bunch for the sources, though. I agree, This is very clear on all the essentials. On a secondary point, do you you think the 'distinct anarchist bloc' was an effective way of spreading internationalist ideas, given the overtly nationalist, pro-war character of the demo? Brilliant piece Django. I'll link to it on af-north. I suggest other groups do the same. Alf - I made a number of comments on the original thread on the matter saying that I don't think black-blocking is the way to make the ideas relevant to people - especially because as I say above lots of people have been drawn into the demonstrations out of a basic revulsion at events, and those are who we should be talking to. But that section was meant primarily as a commentary on events. Its good that they felt they needed to seperate themselves from the tone of the demonstration, but as I've said elsewhere I think that people need to reflect on why they are on these protests, and gear their actions towards looking outwards rather than inwards at the ghetto. But both claims here could easily be true, some of the lightly wounded very well might choose not to cross, perhaps more because of the fear of getting shot on the way rather than taking a stand against Egypt. There doesn't seem to be an actual Barhoum quote about this. It's clear many wounded did cross, so I fail to see what anyone is suggesting Hamas (awful as they are) could possibly achieve or seek to achieve by a temporary delay. "Egypt is requiring written approval for all foreign nationals by their governments to go inside Gaza, a bureaucratic measure creating entry delays." If the choice is between believing the Egyptian government or the Gazan government, I choose neither. And how is targetting Starbucks classical anti-semitism? Hamas were demanding that Egypt transfer the medical aid over to them, rather than opening the border for the treatment of the wounded in Egypt. It seems that they would have gained a propaganda advantage by providing it directly to the population, so theres a motive for using the refugees as bargaining pieces towards this end there. I'm sure Hamas would have got a similar propaganda victory out of saying that the Israeli airforce was holding up refugees, which is more plausible than them restraining themselves in protest, before climbing over barbed wire against armed police later on. Its murky. I'm sure that we'll find out more information about events as it surfaces though. Firebombing Starbucks isn't classically anti semitic, but daubing "kill jews" on the street is. Hamas Sunday called on Egypt to open its border with the Gaza Strip forever and for all residents, not only the wounded persons. "We reject this odd stance: opening the crossing for the amputated bodies and keeping it closed before 1.5 million of human beings in Gaza," said Hamas spokesman Fawzi Barhoum. [...] At a press conference in Cairo, Egyptian Foreign Minister Ahmed Abul Gheit accused Hamas of barring hundreds of wounded from heading to Egypt through Rafah crossing point. But Barhoum rejected the accusation, saying Egypt only asked to send the most critical cases to receive medical care in its hospitals "and then it will return them back (to Gaza) in coffins. If Egypt was to take a position, it should be expressed by opening Rafah crossing forever and supply Gaza with food, medicine and medical teams"
Of the four (or more) Starbucks in London that have been attacked, there's been no such graffiti (that I know of), but you describe the Tesco attack as being in the same night "following earlier attacks on Starbucks" as if they are all directly connected - which they may be - and the 'firebombing' happened after the Tesco was smashed. An Egyptian medic said that "sometimes they (Hamas) say they're going to bring people, sometimes they say they're not going to bring people. Now they say they want medical supplies for the wounded." Still, like I said the circumstances are murky and none of the sides are going to be honest about whats going on, and both the IDF and Hamas have a record of interfering with journalists making it difficult to establish whats going on for certain. But its clear that the refugees and wounded are being played for political gain by everyone. The firebombing of the Starbucks did happen after the smashing up of Tescos - you are right. I didn't say they were all connected, even though they all happened in the same area. There has been a spate of property destruction though, some of it with very clear anti-semitic overtones (as with Tescos) and some which is just pointless (as with Starbucks). Hamas gradually found itself exposed to many of the same accusations it had previously directed at the Palestinian Authority. Total agreement and support to your article, Dyango. In Valencia (Spain) were a shamefull demostration: supporting "palestinian resistence" (maybe too much ambiguous) but some people cried supporting Hammas (like before supporting Hizbola at Lebanon invasion). Sadly, in privacy, some lefties talked about the "murderer jews" and the lobby jew; and, in public, they not shame about supporting "the right of Iran to have nuclear weapons". Even people who call themselves "libertarian". We need to enforce Internationalist media. I'll try to translate this to spanish and to publish it, at alternative media. Unfortunatilly, they are controlled by lefties, and maybe won't publish it.